In this interview I speak about some of the benefits of yoga for people with Special Needs, and the NEWEST CLASS I'm teaching. of a series of interviews regarding Lisa Serran. Lisa has been a yoga student of mine for 6 years. She has had tremendous success at reducing the chronic pain she had experienced due to her severe lordosis and scoliosis. In Part 2, hear from Lisa herself! Please click on the MEDIA RELEASES button to learn more! 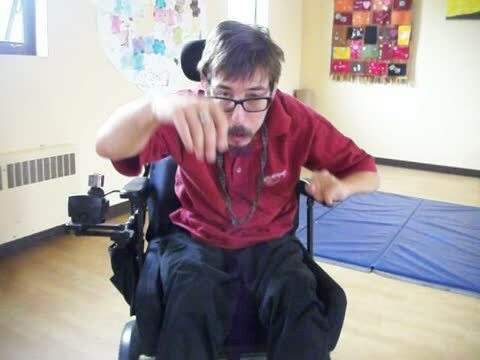 Check out this CNN NEWS SPOT on Yoga for disabilities! Improved joint functioning, decreased pain, better sleep, improved focus, body consciousness, clearer sinuses, correct alignment and ability to concentrate are some of the benefits participants are experiencing. We focus on proper breathing, proper posture, correct alignment, core strength, relaxation and concentration. Join the ongoing classes anytime! Suite 115 at the Jackson Park Health Center! Call 519-966-2141 to register. Registration for these and other specialty classes at Suite 115 is done through Windsor Squash and Fitness Club. Jackson Park Health Center and Suite 115 are fully accessible. Jordyn Bruner (pictured above), a 23-year-old woman with Down syndrome is in her 7th year of practicing Modified Yoga with Coco! Her mother, Tracey Bruner, has this to say: "Since Jordyn has started taking yoga, her muscles are more toned than ever. She has learned to concentrate on the areas of her body that have caused her discomfort, giving new strength and energy to those areas." Jordyn herself says: "I love YOGA because it's good for you and your body as well!" This is a testimonial written by Verna Whelan, whose sister Tina (pictured above) began practicing Yoga with Coco in 2012. "Tina looks forward to attending yoga and uses her yoga knowledge on a daily basis. Her physical strength has increased which in turn has aided in her concentration, her balance and her coordination. Her fitness level benefits her increase in energy, her maintenance of sugar levels for her diabetes and her alertness. She has increased her confidence and she is able to assert herself and have people around her listen! The physical, emotional and mental strength she has gained from yoga increases regularly and adds to her independence and self-confidence." 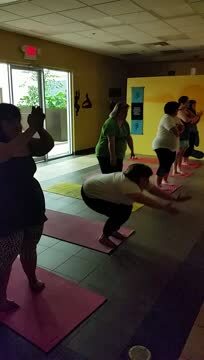 Below is a short video of Lisa joyously praising Yoga! Check out the videos, below, from Summer 2015! With weekly guidance, these yoginis are able to practice Sun Salutations with little-to-no cues! We have a great time each Thursday morning at 10am at HARMONY IN ACTION!